After I replaced Responsive ad units with fixed size ads, my RPM / Earnings went up more that 85.6%! I did this by identifying the device (Desktop or Mobile) and serving appropriate ad sizes, which provide maximum CPM (RPM). This feature is now a cornerstone of my AdSense Ninja WP plugin (along with Easy Ad Placement, AB testing, ads in comments). There are 3 main issues that make Responsive AdSense ad units not perform as well as fixed size ads, which lowers you RPM and earnings. Below I will explain what these issues are and how I resolve them. Google has created responsive units for people who cannot properly insert adequate sizes in Mobile versions of their websites, as well as desktop versions, with content width of LESS then 728px. The basic benefit of using Responsive ads, is that if your site uses one template for both Desktop and Mobile visitors, the same add will show “proper” ad size based on user’s screen resolution. Since most people do not know how to display mobile units for mobile visitors and desktop units for desktop/tablet visitors, responsive units are supposed to solve the problem. However my tests show that by manually inserting FIXED ad size units, you can increase your RPM / earnings by more than 80% in the same placement! Proof below. Because on each page load a different ad size is shown, it is difficult (let’s say impossible) to track which size actually performs better for you, and converts visitors in ad clicks. Additionally other ODD sizes can show up, but usually you will see one of the 4 above. However, 468×60 ad unit will often show, and it is BY FAR the worst performing ad size of all that I’ve tested in the last 8 years, rivaled only by Text Link units, that perform even worse (but that is expected). If you run a Responsive ad on a mobile version, you will often see the standard 320×100 ad unit, which in my testing also performs really poorly. If you want to test 728×90 vs 336×280, you cannot do this, because diffident sizes will load for different people, and you cannot see which size performed well for a particular Responsive ad. You also cannot limit which sizes show up. You also cannot do A/B testing of color pallets, and all units show the colors that you choose in ad unit settings. So at the end of the day, this is the most important metric for an AdSense publisher – the more money you earn, the better. As you will see below, after replacing Responsive ads with fixed ad sizes, my RPM / Earnings went up more that 85.6%, in the same ad spots, with relatively stable traffic, and no changes to content / site design! So that we remain objective and accurate, let’s make adjustments for traffic changes. Traffic Before Purchase: From April 15 through May 26, there were 62271 Sessions and 53017 Users (unique visitors). I use dates form 04/15/2016 through 05/26/2016, because that is what I have for Proof of previous owner’s AdSense earnings. This gives us 42 full days of Analytics and AdSense earings stats. Based on the numbers above, we get an average of 1483 sessions and 1262 users per day, before I purchased the site. Traffic After Purchase: Note, I bought this site on June 2, 2016, so my earnings and stats begin from that date. Now from June 2nd through Jun 19th (last day is incomplete, as I’m writing this on Jun 20th, and it is 1pm EST now), which is 18 complete days, there were 25927 Sessions and 22453 Users. This equals to an average of 1440 sessions and 1247 users per day, after I purchased the site. So for the purposes of being accurate, visitors/day has actually dropped by a fraction of 1%, which is negligible, and I will not make any adjustments to calculation of increase in Earnings. How much did earnings increase? 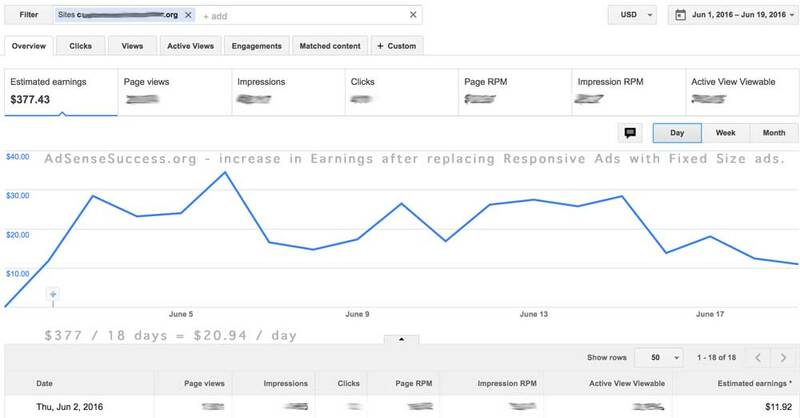 Lets take a look at BEFORE and AFTER AdSense stats. Note – I obscured all data that AdSense TOS prohibits me from showing – this includes clicks, CPC, RPM, Page Views, etc. I only show EARNINGS. AdSense Screenshot – Before I bought the site: As you can see from image below, in 42 days the site has earned $474 or $11.28 / day. AdSense Screenshot – After I bought the site: In 18 days the site has earned $377 or $20.94 / day! So let’s compare. Before I bought the site, it had responsive ads everywhere, but only one unit got over 94% of clicks. I’ve replaced that responsive units with Fixed size units, after acquiring the site, and left placements unchanged. So what FIXED SIZE ad units did I use? For the desktop site version I used a 600×280 custom size rectangle unit at the top (most clicked ad – over 90% of clicks), which displayed mostly 336×280 image ads and 600px wide text ads. For the mobile version I used 300×250 ad size. Note – the site is based on WordPress and uses a free directory theme (not exact name). I actually do not like the theme at all, and will be replacing it, as well as doing an A/B test between the old theme and my new custom AdSense Optimized WP theme. I will report my findings after running the test for at least 1 month. The current theme is Responsive, and ad placements are identical – 2 ads are placed in Widgets area, and one is custom inserted in the top of content area. I use custom PHP code to detect MOBILE visitor, and based on USER-AGENT, show Desktop (600×280) or Mobile (300×250) ad units. I do not use any plugins for inserting ads or detecting mobile visitors – all of this is done through WP Theme Editor, using my custom PHP codes. 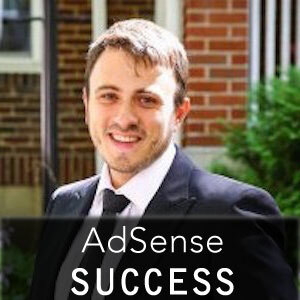 Once I publish my AdSense Success Udemy course, students will get free access to my Custom WP AdSense Theme as well as PHP codes that I use. 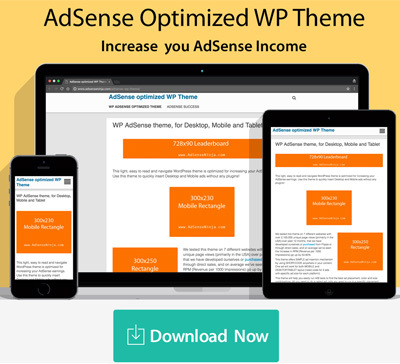 I also plan to release my AdSense Optimized WP theme as a separate product, and it will contain all the necessary PHP code for Mobile/Desktop ad switching, AB testing, and optimizations. Great article and greater video while I was really thinking of turning on Adsense responsive ads sooner or later. You saved me the bother of having to deal with shits of lowering ad revenue, thanks for that! Yeah I totally agree that ads of responsive ads are not really catchy and they’re too small to catch up with people’s eyeball. That came easy to me for all understanding on the type of ads after watching your video! Thanks … but i am revisiting the responsive ads idea … it seems like on certain sites, responsive ads on mobile may actually be not that bad after-all … I’m running a test now, but need more time for good results. 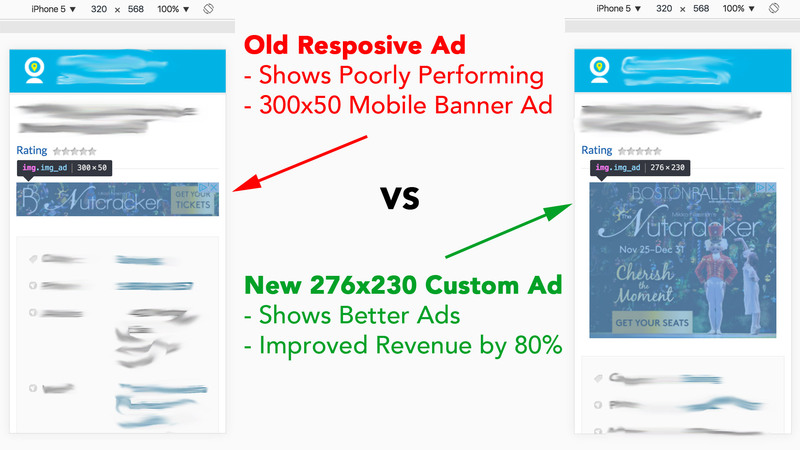 So far on Desktop, responsive ads lose to fixed size ads by 80% !!! OMGGG AAAAHHH … that is fixed ads make 5X more! … but on mobile it’s more close. That said, i had a couple of fringe $20 clicks on responsive ads, which skewed up the stats … so really need to run it for at least 30 more days… and the traffic on that site is only 300/day, which does not help. A also did an extensive 40 day review of Auto Ads and conclusion is – auto ads very bad 🙂 … fixed ads made 61% more! PS – i’ve finished my plugin, which is now available for sale, and totally solves the responsive ads problem! So is responsive still bad? Have you tried Adsense in-feed ads? Responsive ads did get a bit better on mobile, but not always. On desktop, it is outright horrible. It is also highly dependent on site content, and country of your visitors. You really need to test, with a lot of page-views (impressions) and give it at least 2 weeks to run, even if you have high traffic. As example, I was testing a responsive ad recently, on high traffic website (~ 10000 visitors/day), against another ad size. During first 24 hours, responsive was winning by 2:1, and I almost made a switch, thinking I got enough impressions. But then, I decided it was not statistically significant, and let it run 3 more days. Now at day 4 of the test, responsive ad is losing by almost 2:1 margin in the same test. Takeaway from this: Always test, test long enough. Now if I did not have my plugin, I’d not even test (most likely), because manual setup is too complicated. So I would use “conventional wisdom” and my default ads layout. However with this test (when it’s complete), I will be able to see which ads work better. Desktop: In the same test (same ad location), but on desktop/tablet, Responsive ad performs 3 times worse than a fixed size ad, in RPM/revenue. So for desktop, responsive is not good. However, Google’s idea for responsive ad was that it works on both desktop and mobile – right? Well it clearly doesn’t, so you need some type of method to split pageviews between desktop and mobile visitors, so you can show best performing ads, and don’t lose revenue. This is where my plugin is perfect! I have a new site, and it was making about $450/month before I acquired it. I was able to increase the RPM by 50-70% (it’s too early to tell definitively), but if we use media 60%, revenue should increase by $270 in the first month. So if I were to buy my own plugin, I would earn back what I spent on it in fist 20-40 days ($159 for single site to $339 for unlimited sites license), and then make $3000 extra, during first year (assuming traffic stays the same)! I found the switch to responsive content ads terrible for revenue but this has improved a lot. 1) Google doesn’t want you to modify AdSense code, which this sort of is doing. 2) I found horizontal ad units to work pretty poorly for me, across many websites. However if this works for you, it’s awesome. 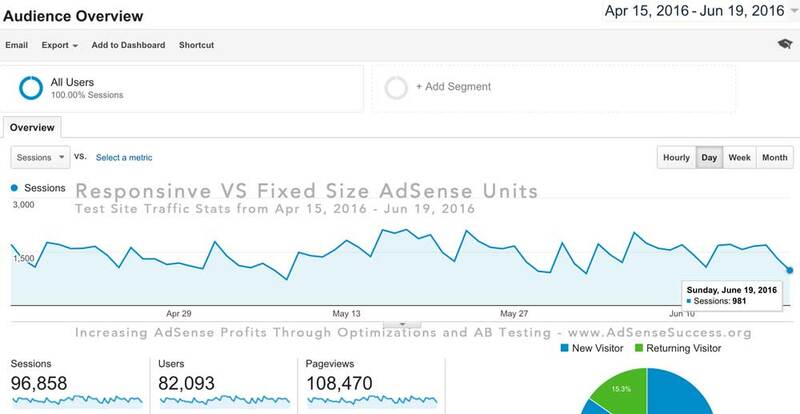 Have you tried A/B testing different ad sizes in real time? Sounds like you know some coding, so you could try PHP rand() or shuffle() functions to rotate horizontal VS rectangular ads, and see what works best. Also this function is built into our AdSense plugin, which makes AB testing and serving Mobile / Desktop ads much easier. I am glad I stumbled on your page. I am new to Adsense, so, I have not tried anything different asides what my developer has set up for me. I saw the notification by Google asking me to try out the responsive ad units, and I came searching for answers. I own a blog, and I would love to up my revenue. If I install your plugin on my Adsense, would it automatically send the responsive ad units to the mobile visitors and leave the fixed size for the desktop. I would also like to connect one on one with you. I need a mentor. I know it won’t be free, but I need someone who I can always talk to for advice. Cheers. Now you would have to do the initial setup, to designate a responsive ad unit to show for mobile and a fixed size ad for desktop. Once you do the initial setup, the plugin will automatically show ads that are appropriate for the device type. You would also want to disable other Ad serving plugins and Auto Ads (if you are using them) – otherwise they will all show up on your blog, and clog pages with ads, and possibly even have conflicts. Now what you also should do if you get the plugin, is run some AB test. You’d be surprised by the results that you may get. After I began actively using my own plugin in Sep/Oct 2018, and running test, I was able to DOUBLE page RPM/CPM across multiple websites So as the traffic on some of these sites is growing, revenue is going up exponentially!